My displeasure may last for a moment, but My favor is yours for life. For his anger is but for a moment. His favor is for a lifetime. Weeping may stay for the night, but joy comes in the morning. I can remember times when our children were young, they would sometimes do things that required my discipline. Even in the most serious of situations, my displeasure with them only lasted but a moment. Any loving father or mother knows that little kids will inevitably make some mistakes along the way and there is loads of grace for that. I always anticipated being able to get back playing with my kids as soon as possible after a moment of discipline. There is an old saying that parents have said throughout the generations just prior to dealing with issues of correction... "This is going to hurt me more than it hurts you." As a child myself, I had a hard time believing this statement, but as a parent, I can really identify with it. If we in our humanity feel this way towards our children, how much more does our Heavenly Father feel this way towards us! 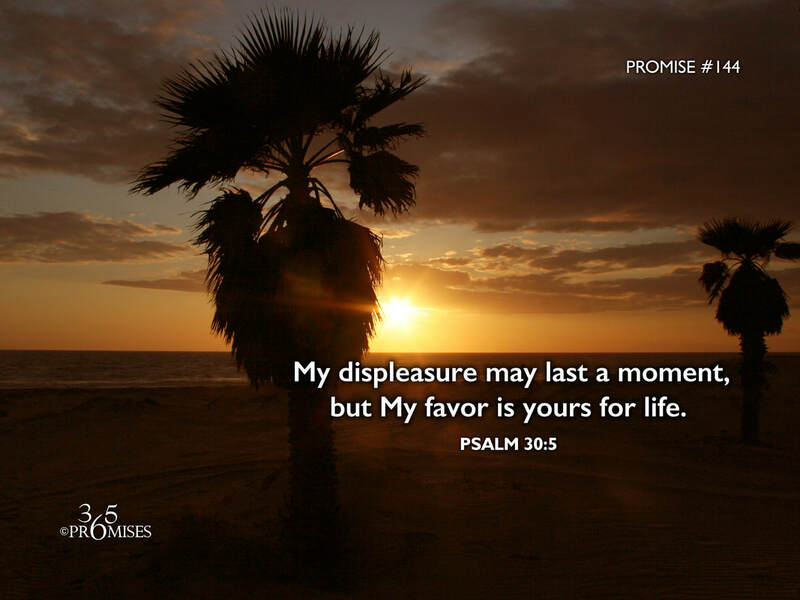 That is why King David says in today's promise that God's displeasure only lasts for a moment, but His favor is ours for life! May the love of God dismantle every wrong belief that we have of the character and nature of our Heavenly Father. He loves to love us at every turn! He can't help but love because He is the epitome of love itself! May you feel His favor shining upon you today and for the rest of your life!